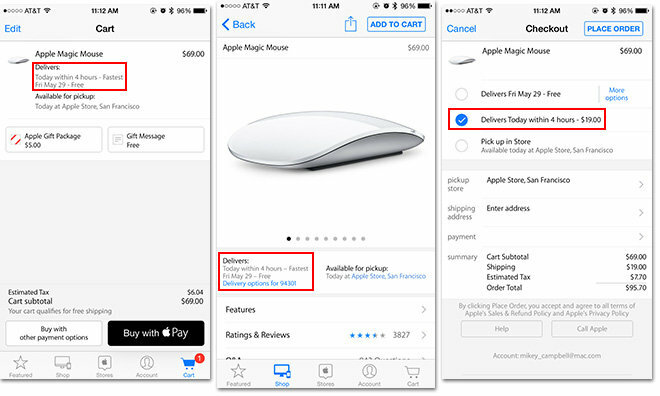 For areas where Postmates shows up as an Apple Store app delivery option, customers can expect delivery times from one hour to one day depending on product and driver availability. The service, spotted by MacRumors earlier today, is selectable on checkout as a $19 option. Postmates currently operates in select cities in Arizona, California, Colorado, Washington, D.C., Florida, Georgia, Illinois, Massachussetts, Minnesota, Nevada, New York, North Carolina, Oregon, Pennsylvania, Texas and Washington, though Apple Store shipping is not available in all areas. A full list of supported cities can be found on the Postmates website. Today's addition comes less than one week after the Apple Store app was updated with two-step verification and deeper Touch ID integration.